The Easter bunny came early this morning to leave easter eggs to all the good little girls and boys.... when to his surprise..... he found an imposter laying plastic eggs in the grass. 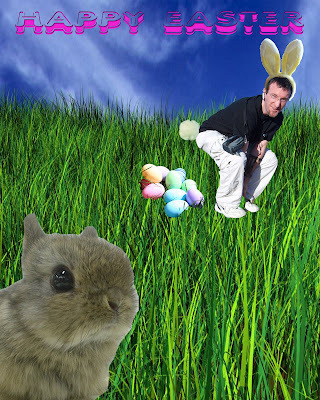 I could imagine that the Easter Bunny was pleased to know that this cute little bunny imposter did not know the real secret of easter egg laying .........BUT FARMER "BUFORD MATT BUNION" KNOWS THE SECRET!!!!!! 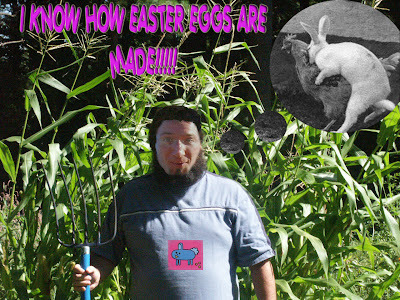 !..................He personally saw just how these wonderful eggs are made....... YOU CAN'T FOOL HIM!!!! He's a smart one......can't you tell??? ?